Me climbing Bones (V0 4c) at the Cioch Top Boulders at Curbar Edge. Snow falling on the tops above the Vale of Edale in the Peak District. Climbing problem number 12 on the yellow circuit at Canche aux Merciers. Me trying to do the crimping and smearing start of problem 7 on the orange circuit at Roche aux Sabots. This photo was taken by my 3 year old son. Climbing Eeny (VB 4a) at Stanage Far Right. Me climbing at the Stronghold Climbing Centre. Me trying to climb Easy Groove (V0 4c) on The Grooves boulder at the Roaches. Seconds after this photo was taken my left foot slipped and I flew off the rock. Climbing Joe’s Portholes (V0+ 5a) on Joe’s Boulder at the Roaches. Me climbing Clammy Wall (V0 4c) on the Clammy Hands boulder at Newstones. Me climbing an unnamed 4C problem on the Wavelength Boulder in Llanberis Pass, while Katrina spots me. The Llanberis Pass, with the Wavelength, Pieshop and Utopia bouldering areas on the mountain side. Me climbing Tiny Slab Left (V1 5b) on The Tiny Slab at Burbage North. An icy Corn Du in the Brecon Beacons. Me on the summit of an icy Pen y Fan in the Brecon Beacons. Sgwd yr Eira (a beautiful waterfall that you can walk behind). The woods around Fontainebleau have a reputation as one of the best places in the world to boulder. Thousands of sandstone boulders, with tens of thousands of boulder problems, scattered about a pretty forest that covers some 300 square kilometres. Fontainebleau also has a reputation as being a great place to take kids. That’s a reputation that my wife and I have found to be deserved on our trips over the last few years. It’s been a bit daunting and challenging at times taking a teething baby and then an energetic toddler on climbing trips in a foreign country, but it’s also been fun and taught us things about being parents. Me bouldering at Canche aux Merciers with my son. I love bouldering at Fontainebleau. There are so many wonderful things about it. All those boulders scattered through a pretty wood. A stunning amount of climbing, in a wide variety of forms and often on boulders that weird, beautiful or both. The different characters of the climbing areas. The feeling of community among the climbers. The inland beaches that make for good landings and nice places to have a picnic. That it’s a giant, wooded playground for kids (more about that in my next post). Fontainebleau’s not somewhere I get the chance to go very often and I always leave wanting to go back. Me climbing problem 2 (Second Classe) on the orange circuit at Roche aux Sabots. The Roche aux Sabots sector in the Trois Pignons area of Fontainebleau forest. Me getting some chalk while climbing the pocket-filled orange 13 problem at Roche aux Sabots. The Canche aux Merciers area of Fontainebleau forest. Traversing on problem 9 on the yellow circuit at Canche aux Merciers. A creepy looking boulder in the Canche aux Merciers area of the Fontainebleau forest. 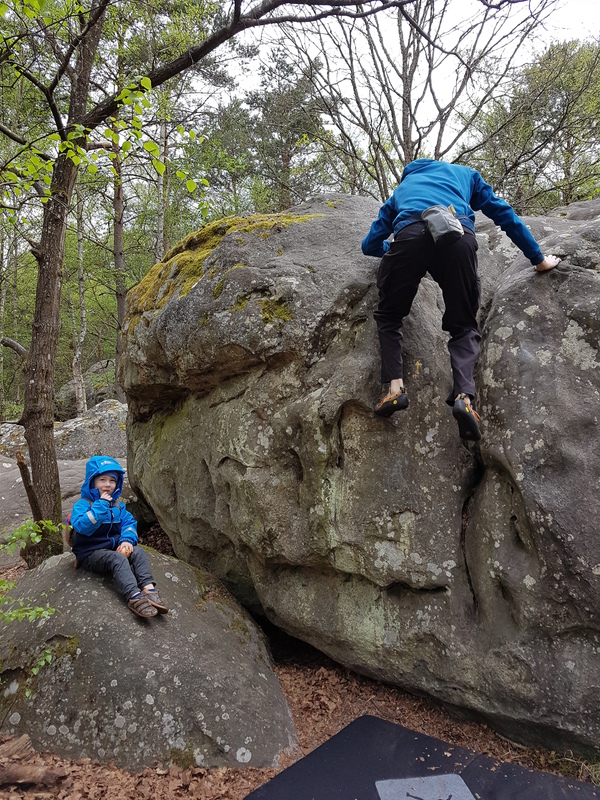 UPDATE: 19 May 2019 – I’ve written an expanded blog post about bouldering at Fontainebleau with a toddler that uses my experiences of this and earlier trips.